The materials related to StarBED are stored on this page. 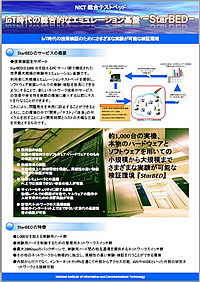 It is Promotion movie about "StarBED Project" and StarBED. The latest Brochure is available here. Please click the following image to see and download the brochure in PDF. As a general rule, third parties may NOT use the StarBED logo. However, under the limited circumstances, third parties may use the logo in accordance with the guidelines. See the 'StarBED Logo Guidelines'. The StarBED logo is designed in combination of a symbol that represents server racks housing more than 1000 nodes and a logotype 'StarBED'. In all other circumstances, third parties must obtain permission in advance. 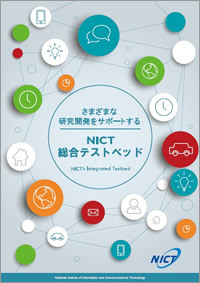 Contact us 'sb-contact@ml.nict.go.jp'. ONLY 'Official StarBED Logo Data' is approved for use. (See the 'Official StarBED Logo Data'). It includes various approved artworks and formats. The following artworks included in the logo data file are approved. There are color artworks and grayscale ones. The grayscale artworks are only acceptable when media reproduction is limited. The symbol may not be separated from the logotype. Any use that falls outside of the guidelines is strictly prohibited. Official StarBED Logo Data is available under the above 'StarBED Logo Guidelines'. See the guidelines before use of it. Copyright (C) National Institute of Information and Communications Technology (NICT), All Rights Reserved.